Oh my gosh, the moment I smelled these melts, a dozen went into my cart. It was that yummy! It smelled just like a moist and freshly baked vanilla sugar cookie. One aspect I am loving about Better Homes and Gardens melts… no harsh chemical or fake smells… just realistic fragrances with an awesome price tag. I couldn’t find a scent description for this one but none is really needed. Look at the picture above… sugar cookies with powdered sugar. Mmmmmmm!! I wanted the maximum effect with these melts so I decided on my main living area where I spend most of my time… my great room. I have two melters going at once so I popped in 3 cubes per melter and waited for the magic to begin. I’d say within 10 minutes, the scent started really saturating the room and it was AWESOME!!!! 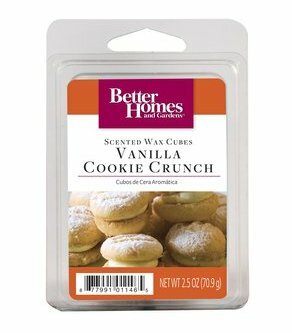 I am a big fan of cookie scents and this is hands down one of the best sugar cookie fragrances I’ve ever tried. I am so beyond impressed with this brand. Vanilla Cookie Crunch is a buttery, doughy, sugary, moist, warm and full of vanilla goodness cookie scent. You will want to eat it. Also want to add, my family loved this scent just as much as I did. Both boys thought I was baking something. My hubby said it’s one of the best vanilla scents I’ve ever melted. He’s right… it IS!! This is a keeper… everytime I’m at Walmart, I’m buying multiples at a time. What is that called? Hoarding! Stockpiling… take your pick!! I don’t ever want to run out of this scent. Scent strength: This gave a nice medium throw. It wasn’t super strong (which I would have loved ever more) but it was decent. Vanilla or cookie lovers, GO GET SOME!! 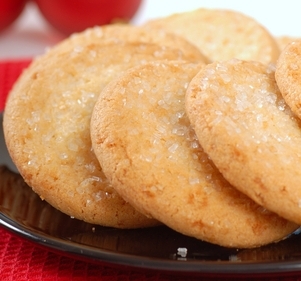 Better Homes and Gardens version of vanilla sugar cookies.